Instead, I hugged two sisters-in-law, glad to see them. We ate a nice dinner together at the old dining table with the oak captain’s chairs. I was relieved for a little sense of what used to be. Even though everything around the table had changed, it still remained the center of laughter and chatter. The sisters got out a box of family photos and told me to go through and take what belonged to my family. My husband’s high school portraits. What a gas. He had such a skinny face. The kids as toddlers. So sweet. And then the sisters told me to look through the garage at what was left to see if I wanted anything before it was all taken away by a charity. I did not like that idea. I couldn’t imagine wanting a single item. Canning jars, maybe? We had moved to a smaller house a few years earlier, chucking giant piles of belongings. I had no interest in collecting more things. I didn’t need any mementos. I already had enough memories, and I was fine keeping it that way. There was something else, too. I dreaded seeing the folks’ belongings all lumped together and cast off. I reluctantly headed for the garage, feeling more a sense of duty and obligation, a necessary thing to get over with. Then I could go back empty-handed, content that I had looked, satisfied my curiosity, and said goodbye. The door to the garage banged close behind me, startling me, and setting off a pounding echo from the concrete floor that faded to an oversized silence, sealing me into an unsettling aloneness. I stood there for a long moment, waiting for the loudness to dissolve and my eyes to adjust to the dim gray. The garage was strangely empty. The little white car was gone. The sturdy wall shelves that had been full of wrapping paper and garden pots were bare. A few tables and shelves in the middle of the garage were spread with odds and ends, the rejects of the rejects, the leftovers of two lifetimes, all the things that had been picked over and passed on by the rest of the family and a stream of strangers. Round price stickers randomly flecking the piles formed a misshapen dot-to-dot puzzle. As I stood back a little, my eyes apprehensively wandered over the assortment. It was smaller than I had expected, though I’m not sure what I had expected. I just knew it wasn’t this. My heart, already heavy, sank even more. My brain was decisively against wanting to find anything interesting. It seemed unwholesome to take something. I slowly walked over to a table and lazily fingered through a box with a few jewelry pieces in it. I didn’t need to move them around to see them, but I had to touch them, lift them up, look them over one last time. I glanced around. A box of brads, some candles, a casserole dish, neatly folded linens. As I had expected, a little relieved, nothing of interest. Then I looked at the linens again. And I started searching. Quickly. There was one item. One item I would want more than anything. One item I would gladly collect, even though I already had more of them than I needed and the drawer was overfull. One item I had always loved. Could it still possibly be here? Surely, someone had already put dibs on it. Surely, it had been long gone. And then my eyes fell on it. The familiar gold and brown. My heart leaped. I couldn’t believe it was still there. No one had wanted it? No one? 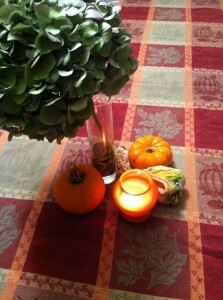 It was a plaid tablecloth with pumpkins and leaves. I picked it up and looked it all over. It was in great condition. No rips, no stains, no pulls, no frayed edges. The nubby fabric was worn to a comfortable softness, all the starch gone so that it was immune to wrinkles. Really, no one had wanted it? This tablecloth had been spread on the folks’ dining table every time we had visited for the past handful of years. Even though it screamed November, it was on their table at New Year’s and in the middle of the summer, which made me secretly smile. I had always admired it. At first it was just a nice tablecloth. Then on subsequent visits it was oh, this tablecloth again. The one I like. So pretty. Then, gradually, I began to look for it every visit, comforted and charmed and never disappointed, even when it was covered in crumbs. No matter the time of year, in this tablecloth I could see the folks with their heads together doing a crossword puzzle. I could see them patiently playing Kings in the Corner with the kids, whose hands were just growing into the playing cards. I could see corn chowder and fat fava beans. Mr. Scatter’s dad passed away July 9, five days shy of his 95th birthday. On Thanksgiving, when Mr. Scatter talked to his mom on the phone, she was certain she had eaten ham for dinner. I’ve been happy to pull out this tablecloth for the past two falls, especially at Thanksgiving, when we cover it with goofy-looking gourds and enough mashed potatoes to fill a large teenager. Sometimes I bring it out other times of the year, too, just for fun. A large game of Clue covers it well. The boys do their math homework on it and eat quick breads. I’m happiest when it’s covered in crumbs. Even though Thanksgiving has passed, the tablecloth has already gone into the laundry basket, and it’s time for Christmas colors, I might have to continue putting it in the rotation for a while. Just the right size, it fits our dining table perfectly, this tablecloth that no one else wanted. PHOTO: It’s just a tablecloth to some people, but to us it makes Thanksgiving special. Previous PostA galaxy of recipes and remembrancesNext PostIt’s First Thursday. Do you know where your art is?